I have to say I'm really excited to taste this wine again after being away from the wine scene for some time. I took a month long sabbatical to South America and actually recently had another child! Congratulations to me! Anyways, the last time I tasted this wine I really loved it and thought it was perhaps one of the best value driven wines in the whole industry. Take a look at my previous review of the 2005 vintage here. 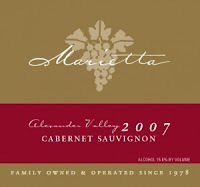 The 2007 vintage in California was widely excepted as one of the better vintages of the decade and although wines tend to vary with every year, Marietta has also been one of my favorite wineries because of it's unshakable consistency. 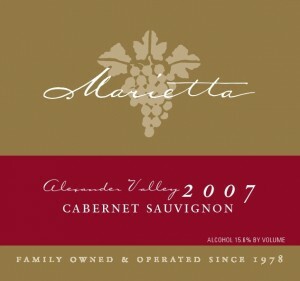 The 2007 Marietta Alexander Valley Cabernet was released in June of this year and prior to release was aged for sixteen months in French oak barrels. Now, one of the things I have really loved with this wine is it's pure black fruit aromas, and the 07' is packed with black plum, cassis, graphite, hints of toasted cedar, dark chocolate, and melted black licorice. The wine is quite dark in color, which I find is typical of these ripe Alexander Cabernet's. On the palate the first thing I notice it the vibrancy of the fruit flavors....It's almost as if you can taste the warm California sunshine! Immediately intense flavors of black cherry, cassis, spicy licorice, and cacao impact the palate with a tart acidity. The texture of the wine is silky, however the mid-palate offers up a spicy kick and a powerful blast of intense dark fruit flavors accompanied by a generous amount of graphite and cedar. The finish is long and accompanied by some firm but very round tannins.